Jalama Canon Ranch and Vineyard is situated six miles south of the Santa Rita Hills, seven miles inland from Jalama State Beach, and almost one mile west from the entrance on Jalama Road. The famous Santa Rita Hills is only minutes away and the Santa Ynez wine country is just a short drive north. Jalama Canon Ranch and Vineyard has a diverse terrain and natural springs that provide fresh water for the livestock, agriculture, and natural wildlife. The property is an operating goat and cattle ranch, with a maturing vineyard. Just one hour north of Santa Barbara, Jalama Canon Ranch and Vineyard boasts breathtaking views away from the hustle and bustle of daily life. This historic property’s scenery and surroundings are reminiscent of a turn of the century cattle ranch. This charming locale creates a romantic setting for your wedding day. 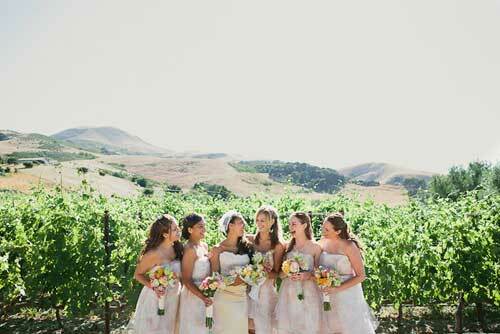 Make your winery wedding feel like a retreat at Jalama Canon Ranch. It’s the perfect wedding venue for any aesthetic you choose. 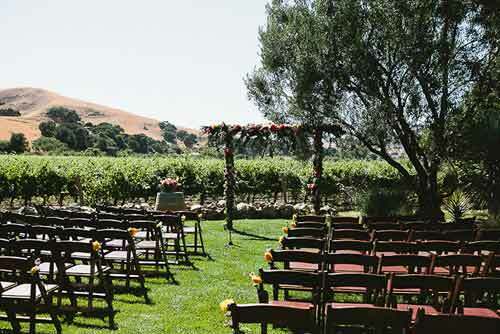 Whether you’re going for elegant and romantic or modern or rustic Jalama Canon Ranch can be the perfect location. Say your vows under the branches of a dozen trees. Host a cocktail party on the expansive lawn – complete with horseshoes. For an intimate setting, serve dinner in the covered dining area or spread the tables across the grass for a dining experience under the stars.